That`s a bit aloof, but decades of building some of the best cars on the market have made Mercedes that way. The list of standard features is endless, including help when you need it from roadside assistance. If trouble develops on the highway, you dial a special number and get an over-the-phone diagnosis or on-the-spot help from a dispatched technician. And how many other carmakers give you a grille badge to display after you`ve compiled 125, 000, 312, 500 or 625, 000 miles of driving? But then, how many other cars still have a grille after 125, 000 miles? Built on a 110-inch wheelbase, the 300D turbo diesel offers huge interior room and comfort, pleasant ride and handling neither too stiff nor too mushy, an engine powerful enough to move you swiftly from the light when you need to or to simply keep you cruising at highway speeds as semis roar by. 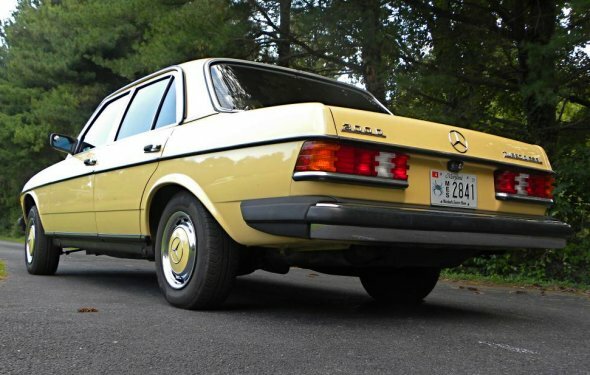 Sadly, the 3, 500-pound, rear-drive Mercedes was more sure footed and nimble on dry roads, a bit finicky in back in gripping the pavement after a light rain. WHILE THE grille is the recognized trademark its rivals commonly copy in their never-ending Mercedes lookalike ploy, the other common trademarks are present: huge, comfortable seats; gigantic steering wheel for the feeling of driver control; ample rear seat room so occupants need not scuff Guccis; and a cavernous trunk. The 300D we drove was powered by a 5-cylinder diesel engine with turbo assist. The turbo gives the engine the power boost most high-mileage diesels need while at the same time quieting the familiar ping of diesel combustion. The engine is rated at 22 m.p.g. city with automatic. Besides the price-$31, 940-cold weather also keeps the 300D driver from losing a sense of reality. Diesel fuel tends to turn to jelly when the parafin in the fuel hardens from the cold. On two occasions on mornings when the temperature hovered below 20 degrees, the engine turned over very slowly. Another irritant was noticing the diesel pump read $1.25 a gallon and the nearby gas pump $1.13. GENERAL MOTORS Corp. recently said it would stop offering diesel engines in its cars after the 1985 model run. Some think this will hurt those foreign makes such as Mercedes that have popularized diesels. A.B. Schuman, spokesman for Mercedes, said the German automaker had no plans to follow GM`s lead. SCHUMAN SAID Mercedes owners liked diesels most for the increased driving range they offered over gas engines. Going from Point A to B on one tank is the chief concern, not paying 12 cents more for each gallon it took to get there. OF CARS EACH DAY AT THE SHOW. HOURS ARE 5 TO 11 P.M. JAN. 17 AND 18 AND NOON TO 11 P.M.
JAN. 19 AND 20. TICKETS ARE $6 FOR ADULTS AND $2 FOR CHILDREN 6 TO 12. CHILDREN 5 AND UNDER WILL BE ADMITTED FREE. STRETCHED VERSIONS, AS WELL AS A VARIETY OF CARS, SUCH AS CHRYSLER`S NEW C-BODY FAMILY CARS AND J-BODY SPORTS COUPES.